Adirondack Nature Detective: Eastern Tent Caterpillar or Gypsy Moth? Did you know that Gypsy Moths were introduced in the United States as a failed attempt at creating a silk industry similar to the silkworm? The Gypsy moth was brought from Europe to Massachusetts in 1869 by Leopold Trouvelot in attempt to breed the moths for silk production. A few escaped and now the moths defoliate trees from east to west coasts of the United States. Well, Mother Nature is trying to trip my apple growing by first giving that cute fawn apple leaves to nibble upon and now a bout with tent caterpillars. So what is the difference between the Eastern Tent Caterpillar, Forest Tent Caterpillar and the Gypsy Moth? • black heads, light brown body with hairs with a white stripe. • The egg sac overwinters and has a varnished look and will appear on small branches. WARNING: Do not attempt to burn tents out of trees. Not only does it damage the trees but may cause forest fires if not controlled. • Caterpillars will have pale blue lines along the sides of a light brown body. •About 2 inches in length. • Adult moths are buff-brown, with darker oblique bands on the wings. 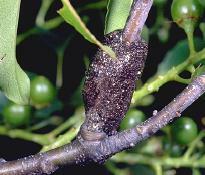 • Look for egg masses to encircle twigs covered in a frothy, dark brown substance. • Also look for a thin yellow stripe down its "back"